Atonal offers an immersive experience unlike anything that I have ever personally experienced before, not only through its inclusive line up of internationally renowned musicians creating ambient environments through a displacement of traditional dance music sounds, or through its magnificent visual displays which run simultaneously to the music all night long. 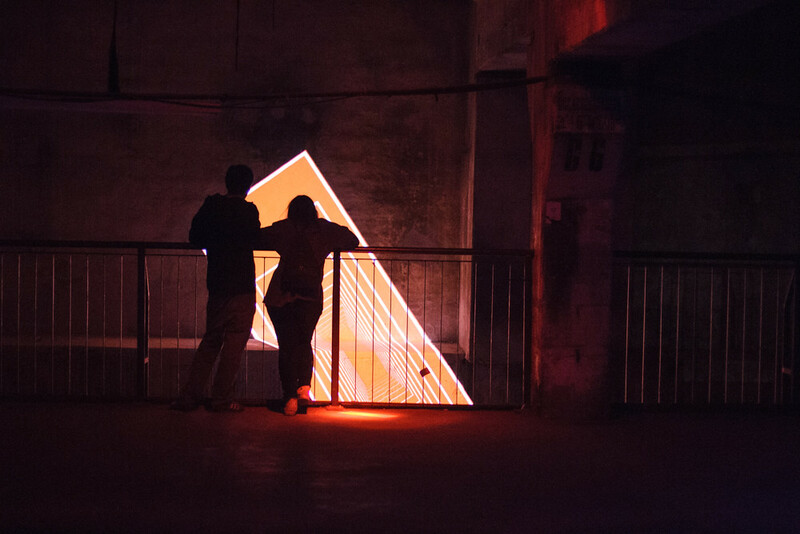 This ambience is then also complimented by the setting itself, placed within a monumental disused power plant where the audience are transported into another realm at the festival, a cavernous adventure occupied by both dark instrumentals and hypnotic light displays. The final factor that Atonal has to offer, truly putting the nail in the coffin of this atmospheric festival is the installation art which can be found scattered throughout the colossal building, with glowing lights, intriguing sounds and pulsating visuals, these works give a new meaning to the artistic term immersive installation. The first installation I had the delight of coming across during Atonal’s opening concert on the Wednesday night, staying silent at first during the atmospheric performance by Ensemble Modern, allowed me a wonderful opportunity to talk to one of the artists from the creative collective ‘Macular’ that bought this piece to life. Having always been concerned with kinetic sculpture, these artists used to focus themselves within the realm of digital art, which to a degree Parsec still is. However, growing restless of the confines of digital screen based work and the parameters of projectors, the group set about enlarging the spatial potential of their work, transforming screen based cinematic projects into the tangible, of which it was clear to see from this mesmeric art work is a transition which happened with great success. 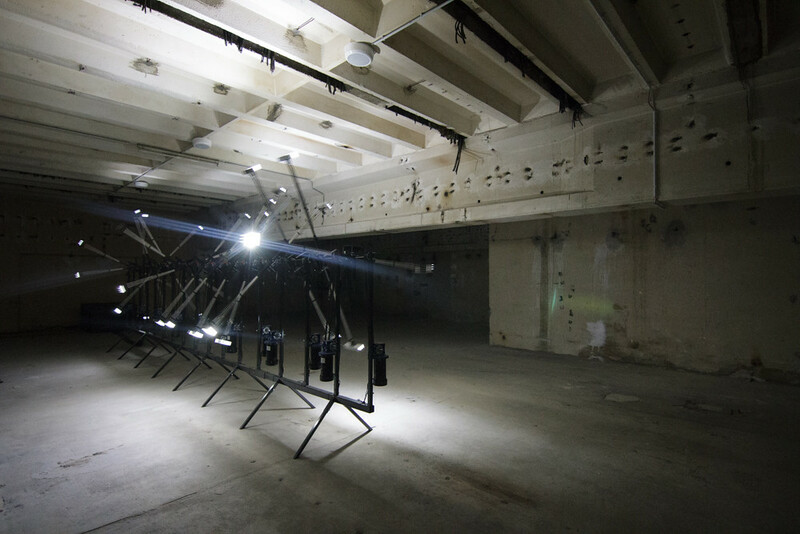 The sheer scale of this work took immersive art to a new level, given apt breathing space on the first floor, the howling of this machine once fully functioning on the second day, with both the sound and visuals running simultaneously, lures you in as you begin to climb the stairs. The dark setting of the festival also allowed Parsecs whirling arms to create a glow, which seeps out of its environment, beckoning you into the space. Appropriately placed seats and benches allowed for its audience to be comfortable as they are sucked into the rhythmic rotations of this monumental installation, capable of spending hours at a time staring into the bright lights of this kinetic machine, audience members could be easily often be seen stumbling out of the room their eyes wide like a child who has been sat to close to the TV for too long. Delta highlights for me the simple, yet impressive possibilities of composition. The piece, constructed by Oliver Ratsi, a modest red rectangle, with insides that pulse, grow and enlarge depending on its musical accompaniment, shows how sometimes even the simplest of pieces can truly interrupt a space. Occupying a great hollow in the downstairs space of the venue this projection based piece seemingly responded to its angular environment as well as its sound based partner to create another mesmerising visual show that acted as a peaceful interruption from the incongruous nature of Parsec. Again you are pulled into the glowing red lure of this work, yet not bombarded by its presence. Nevertheless what I loved most of all was the mimicry it presented of its spatial setting and the sharp angular lines that both redirects and reflects in its environment. It is difficult to do Thomas Vaquie’s 4D justice through a mere explanation of events. The term phenomenology comes to mind when I think about this task, the act of experiencing, which is what 4D definitely was, an experience rather than artwork. So mystical yet enjoyable that I came back a number times to catch different sets being played throughout the weekend. While I was aware of the intentions of the work before being inside it, I can still say I was in no way prepared for the shows that prevailed. 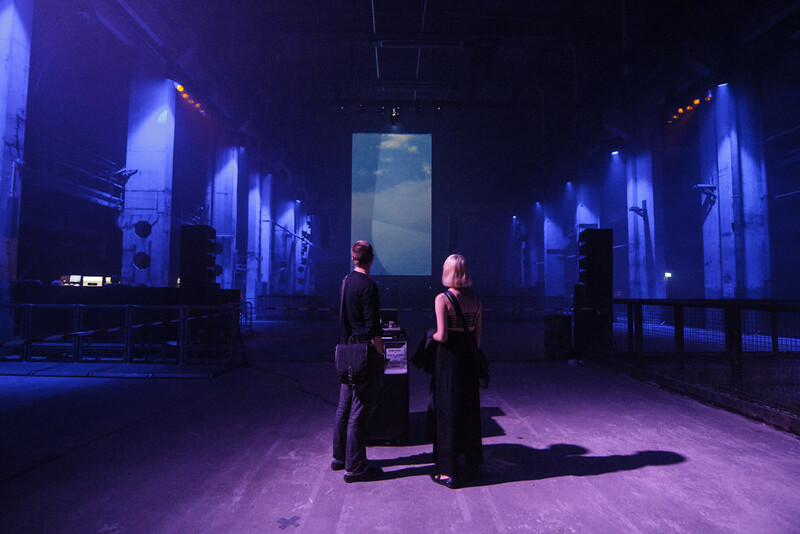 Upon my first entry into the piece, with something as simple as shutting your eyes your are transported into a different world, I had the pleasure of hearing the first set of the weekend by Murcof, which opened my eyes to the possibility of sound as art in our contemporary society. Technology has now reached new levels of immersion that blow surround sound and cinematic sets out of the water, this piece truly moves around you, and you inside it, causing the hairs to stand on the back of your neck as fleeting sounds spark around you as your ears are carried around the piece. Upon my second viewing of the work my curiosity took the better of me as I knew I wanted to see exactly how Biosphere was transporting every audience member (myself included) to a distant and tropic location, taking us away from the concrete centre we are surrounded by and into a new lucid location. Watching the second by second control of this artist at work, you can see the care and attention that is put into each movement of this transformative music. 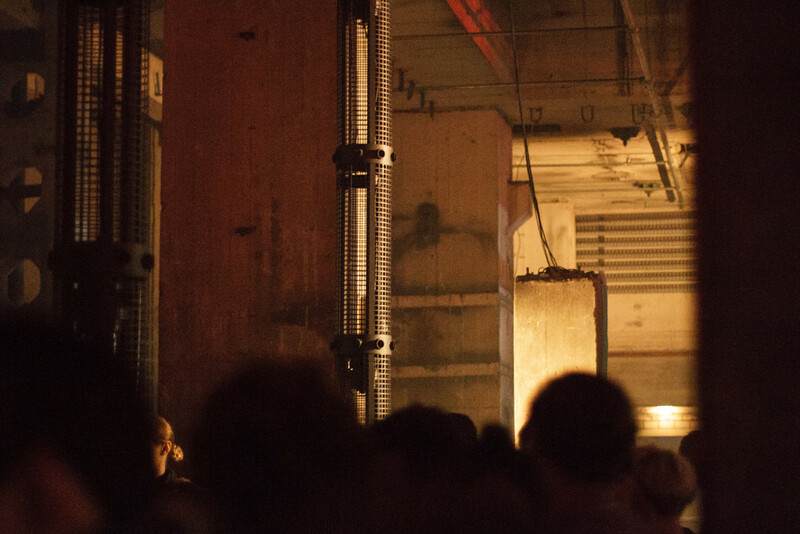 Having the DJ inside the piece itself allowed the audience to drift behind him as he played and appreciate how intricately his set was designed. The site specificity of these art works showed a true level of devotion by the Atonal organisers. Having each set only played twice also brings me back to the phenomenological element - a brief, specifically designed moment to be shared with only those around you, then gone… only until next year I hope though. Something that has always attracted me as an artist to installation work is the idea of a response to, or occupation of space. Creating immersive experiences that almost transport the viewer, either seemingly physically, spatially, using sound or aesthetically. Stepping inside of a work can be a powerful tool that easily removes disconnection from its audience. What I feel worked so well with the piece Pastoral, presented by Geso & Peter Kirn, was not only its setting, seemingly tucked away in the depths of Atonal’s ground floor, almost like a treat for the curious cats that live within us, but was also the space it created; both through its positioning, a clever use of a cubby hole, but also through the visual display it created; a fading cube pulses in front of you, drawing you into the rectangular like space it is presented within, playing with the simple modernist and minimal shape. The throbbing cube floats mid-air and seemingly reverberates the bass from upstairs directly back at you. This pounding and growing, somehow fading and gaining in density simultaneously, truly blurred the lines between inside and outside, between piece and its environment, between subject and spatial atmosphere. Taking an unassuming abstract work and through its reverberating creating an inner dialogue with the disused power plant that Atonal is set within. Perhaps my favourite of the installation art on display over this experimental weekend was Mnemonic Device (presented by Pedro Maia & Marcel Weber) a device that transformed the monumental visuals display screen which had been accompanying the music all weekend on the main stage, this piece allowed for not only immersion but also audience participation and interaction. 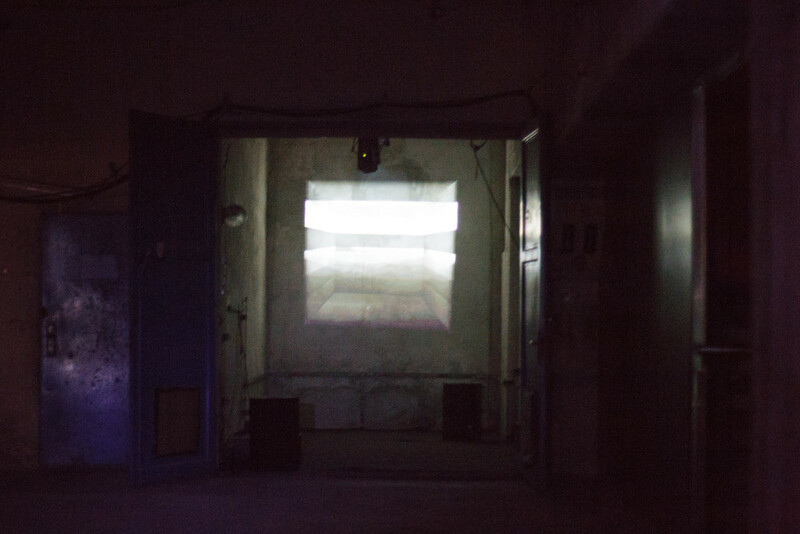 The screen itself filled with fleeting memory-based images was able to be controlled by the audience members, having both its visual interpretation and speed interrupted by audience interactivity. The public are transported from merely static viewers to a regulator of what is presented before them, with the witty use of a vinyl player as the helm of this art work; reminding us of the dual identity of this screen during its night time use. The Mnemonic Device encourages empowerment within its audience members as they are in control of this colossal occupation of space upstairs. One which provides us with this truly trippy audio visual show, drawing you in at first with the absorbing and memorising aesthetic, then leaving you with a slight uncanny taste in your mouth from the snippets of home filmed video you are presented with. It is easy to almost miss the modest controls which act as the gateway into this installation; seeming to innocently lie dormant should no one currently be using the giant device. Captivated by the vast screen it is hard to look away from during the evening concerts, it is only your curiosity that breaks our endless staring to guiding your fleeting eyes around the upstairs space, where I would have completely missed these controls had the appropriately placed ‘Please Touch’ sign not caught the corner of my eye. For me I see this installation as a captivating doorway into the world of contemporary sculpture, which to many can often be seen as disengaging due to its heavy reference to conceptuality. This piece however, sparks the imagination and allows the viewer to take a new role within the festival setting - no longer a static audience member but a contributor to the otherworldly environment we found ourselves in all weekend.